Christmas printable activities and worksheets suitable for toddlers, preschool and kindergarten. These activities are an extension of the Christmas lesson plans and crafts theme. Circle or color day 25, Christmas day. Practice days of the week. 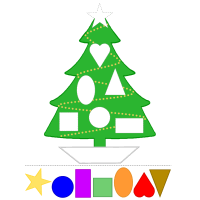 Color in or use stickers for an Advent or Christmas day countdown. Start at the arrow, reach the star. Start at the arrow, reach the star. Count the ornaments. Suggestions: My name is special! Make sure children practice writing their name in the worksheets or write the name for them so they get acquainted to their name in writing.